The NEC MDSVSENSOR3 is a sophisticated next generation colorimeter. It uses a new optical system, filter technology, calibration architecture and intelligent form factor to provide unparalleled color accuracy, repeatability and device longevity. The MDSVSENSOR3 has increased sensitivity and measurement speed which is five times greater than that of the previous generation. The MDSVSENSOR3 colorimeter boasts a high degree of color accuracy on all popular and emerging display technology types including CCFL, white LED, RGB LED and wide-gamut displays. It is compatible with the NEC SpectraViewII software. The NEC MDSVSENSOR3 has many exciting features for users of all types. 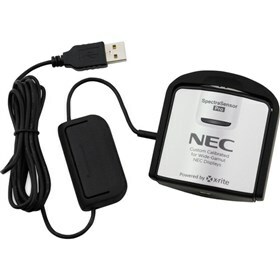 The NEC MDSVSENSOR3 is sold as a Brand New Unopened Item.